Mic Larry born Larry Williams began doing stand up comedy in 2006 and has opened up for Paul Mooney, Mike Bonner, Tony Roberts, and Cedric the Entertainer and Mike Epps in his career. His comedic endeavors has landed him gigs in Hockey Town Theater, The Comedy Castle, Ann Arbor Showcase, The Music Hall, The Millenium Center and Joey’s Comedy Club here in the Detroit metro area. He has also performed nationally at various venues such as Gotham Comedy Club, and Narcotics’ Convention in New York, VP Town Comedy Corner in Atlanta, GA and Jokes & Notes in Chicago, IL. In 2009 Mic Larry was a stand in for Cedric the Entertainer in the movie “All’s Fair in Love” He has since acted in local plays in Detroit, and performed with Dznutz, and GGOC, improve comedy groove. Mic Larry has a heart as big as his onstage persona and has participated in several charitable events. Annually he puts on a show in the community called Laughter and food for the soul comedy show to provide food, and shelter for the homeless here in Detroit. Though he is a comedian he says, “folks suffering is no laughing matter.” For six weeks consecutive he took first place on the “New Comedy Spotlight” hosted by Detroit’s own radio personality and comedian, Foolish. 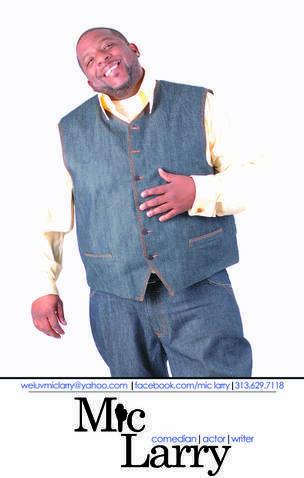 Mic Larry was a contestant in Billy Thompson’s, “Metro Gospel Funny Comedian” and was the winner for 2 years in and row and he has been featured on Detroit radio station 105.9 doing impressions of his favorite celebrities such as rapper Notorious B.I.G.and also his famous impersonation of Detroits own Honorable Judge Mathis. Mic Larry is currently the host of LMAO! Comedy Showcase every Wednesday night at TV’s Lounge in Detroit, MI which features new and tenured comedians, he is also the host of club Mandees on Monday nights which is the longest running comedy club in Detroit. Mic Larry is a talented comedian, a great humanitarian, and has also been the host for 5 years of Bess The Mic clean comedy show. Mic considers his self a family type comedian, with life stories that mainly consist of his kids which he has had costody of for the last 5 years. Mic Larry says the biggest highlight of his career was his oneman show, which 600 fans came out to support him. With a bright future in front of him and GOD on his side Mic feels like the best is yet to come.